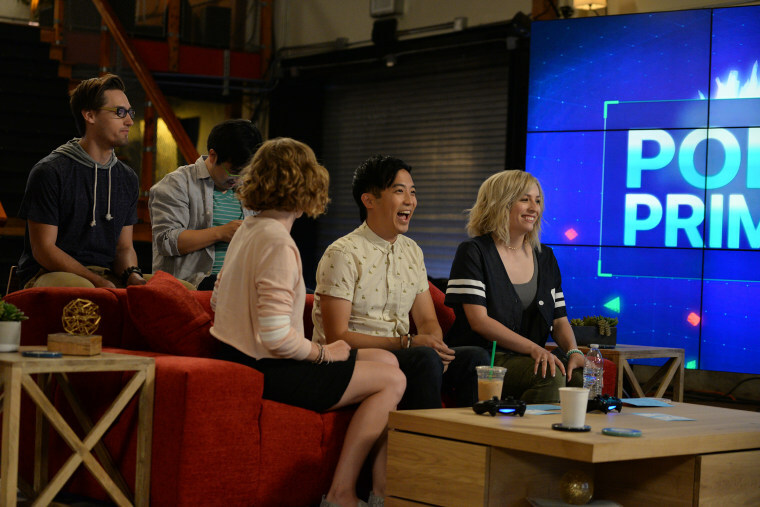 Jimmy Wong currently hosts "Polaris Primetime," a variety show about video games, on Disney XD. It was 2011 when a white UCLA student posted a video complaining about Asian students at the university, attracting angry responses and ridicule. Actor Jimmy Wong saw the video too, but he decided to respond a little differently. He wrote “Ching Chong: Asians in the Library Song,” a comedic parody love song that painted the ranter as misunderstood. The video — one of the first Wong had ever posted on YouTube — was a hit and now has more than 5 million views. The success helped convince Wong, who was trying to make it as an actor, to explore the platform even more. “I started doing YouTube that year after a full year of auditioning in L.A. and really struggling. I was making like $200 a month on average,” Wong said about his acting career. Wong is used to taking unconventional routes in his career. The 30-year-old Seattle native has parlayed his viral video success into acting and hosting gigs both online and on TV. This past summer, he co-hosted “Polaris Primetime,” a video game-oriented show on Disney XD. He also starred in the Streamys-winning online series “Video Game High School” created by his brother, filmmaker Freddie Wong. He also hosts a geek-themed cooking show, “Feast of Fiction” and anchors a podcast about the fantasy card game “Magic: The Gathering.” This, all in addition to winning roles on the big screen (“John Dies At the End,” “The Circle”). Wong said he has always been comfortable in front of the camera, as evidenced by home videos of him performing in his kindergarten musicals. He also uses his voice on social media to advocate for social causes, something he said has gotten him into trouble. Wong said he once lost a partnership with a major beverage brand when they requested he scrub his Twitter feed of political posts. He declined. “The first thing big thing I did was social activism. The thing that put me on the map was me saying, ‘No, I don’t agree with this, this is how I’m gonna react.’ So my career started in politics in a lot of ways,” Wong said. Born to immigrant parents from China, Wong acted in high school plays before pursuing a degree in theater at Middlebury College in Vermont. Wong credits his older brother for showing him that he could have a career in the arts. “To me, it was like, ‘Hey look, if I decide to go into something like acting, Freddie is already doing stuff like that. Maybe we can work together in the future,’” Wong said. He moved to L.A. in 2010 but found the limited roles offered to Asian male actors frustrating, Wong said. After one year, he started posting music on YouTube. A year after that, he started a cooking show. And then a year later, he was on "Video Game High School." He added that he feels that while Hollywood seems to be expanding roles for minority actors, he still finds that “open ethnicity” casting — when casting directors audition actors for roles that are not written as a specific race — is, often, not. “At the danger of offending someone who’s doing it to actually have open ethnicity casting, it does feel like lip service a lot of the time, mostly because I haven’t seen it turn out in my favor or in any Asian person’s favor,” he said. That has made digital and social media platforms, like YouTube, all the more valuable to performers like him. But Wong said his dream job of being an executive in charge of a studio might mean eventually stepping away from being in front of the camera. “My future goal some day is to lead the way for a world where minorities, any race, can be a leading man or woman in a role and never have it be mentioned or referenced in a way that defines that person,” said Wong. He added that his experience on YouTube has provided him a foundation for that, as he has had to juggle many roles but has also learned the value of delegating. Wong said budding online performers should do the same. “I think a big pitfall of YouTubers is they realize they can film themselves. They realize they can write and edit and do all that stuff and be a jack-of-all-trades, and that’s where they stop,” he said. And while he found success by going viral, Wong said ignoring traditional social media metrics — likes, follows, views — is helpful for anyone trying to build a career.